Stunning the world with its search engine tool in the early days of internet, Google has so far transformed itself into a major player in the enterprise realm. Best known for its innovative products in both online and offline world, the company is taking effective measures to infuse cost effectiveness and usability into its offerings. Google has opened up many pathways for the enterprises to conquer the complex world of internet. Adsense, Adwords, and advertising networks serve as the pathways for companies to reach out to the consumers while Google Analytics provides precise information about the successful of reach-out attempts and the areas to concentrate. Google Cloud, on the other hand is solving IT infrastructure worries of start-ups as well as established organizations with its services including App Engine and Cloud Storage. There are thousands of solution and service providers that help enterprises navigate the complex realm of Google's products and services. CIOs and other decision makers in the enterprise have to choose the best vendor that felicitously addresses business needs while deploying the apt solution. As a prelude to CIO Review’s 20 Most Promising Google Technology Solution Providers, our selection panel evaluated the capabilities of several vendors who support core business processes and are at the forefront of tackling challenges in the Google technology landscape. 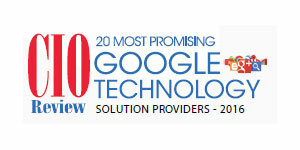 We present to you CIO Review’s 20 Most Promising Google Technology Solution Providers 2016.